Learn how to create a pastel ombre with our LIVE Ultra Brights or Pastel range and check out more info below the video! Ombré hair is a trend that never goes out of fashion, but if you don’t just want to be another ombré in the crowd, why not mix it up with a customised pastel hair version? In our video tutorial Leanne has created a pastel pink and purple ombré look, but you can let your creativity run wild and use any colours to create your own style! Remember to show us your look using #LIVEColour on Instagram. Leanne’s pastel purple ombré hair has been created using our semi-permanent hair colour range, LIVE Ultra Brights or Pastel. For this range, we recommend that your hair is light blonde, so if you currently sit outside this range, you’ll need to pre-lighten first. Check out our range of Intense Lighteners here. You can use shades from the LIVE permanent colour ranges to create an ombré, however, the steps to achieve pastel hair in this article only refer to the LIVE Ultra Brights or Pastel and you should not attempt to mix LIVE permanent shades in any way other than described in the Instruction Leaflet. If you’ve already got coloured hair, it’s possible you’ll need to grow this out before attempting to bleach/lighten at home (depending on your shade and frequency of dyeing). For some more expert tips or general advice on lightening your hair at home, do give our friendly Advisory team a quick call on Freephone 0800 328 9214. First things first – choose the look/shades you want! You can make a statement with blue ombré hair using our Ultra Brights Electric Blue, or get mermaid vibes with a green ombré. And always read the Instruction Leaflet included in- pack. The Ultra Brights or Pastel range is designed to be used on clean, towel-dried hair, so you’ll need to wash your hair before applying your colours. You’ll also need to wear the in-pack gloves, wear an old towel around your shoulders and use some petroleum jelly round your hairline/ears (this will help to ensure that it’s just your hair that’s being coloured!). We also recommend sectioning your hair. Do this by taking the hair a couple of inches either side of a centre part and pin it up. In the next steps, we’ll describe how to achieve the pink & purple look shown in the video – you can just replace the colours with the shades you’ve chosen if you want to create a different colour look. First up, you’ll need to grab 2 non-metallic bowls. In the first, mix a pea-size amount of the LIVE Ultra Brights Raspberry Rebel or Shocking Pink Colour Cream with the in-pack conditioner or LIVE Pastel It!. The more conditioner you add, the more pastel the shade will become and the shade you mix up is a good indicator of the result (do keep in mind that this will also be dependent on how light your starting shade is). In the second bowl, repeat the process using your 2nd shade. To recreate Leanne’s lavender shade, you’ll need a pea-size amount of LIVE Purple Punk and 2 pea sized amounts of LIVE Electric Blue mixed with the in-pack conditioner/Pastel It!. 1. Starting with the hair that is still left down, begin applying the pastel pink mixture through the mid-section, starting at the roots and working the mixture about half way down your hair (to approximately where you want the 2nd colour to start. 2. Continue this all the way round the back of your head, still focusing just on the mid-lengths (root to middle). 4. 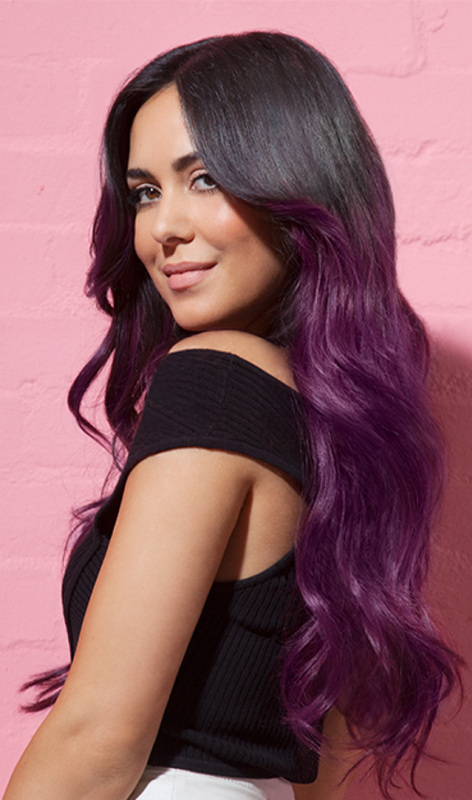 Staying in the mid-section, grab the purple mixture and apply this to the lengths and ends. 5. Gently smudge the pink and purple shades together where they meet in the middle. 7. Take down the top section of hair and continue to apply the pastel pink (first colour) throughout this top section. Applying this way will also help the colours to blend more naturally. 8. Once all sections have the colour applied, leave for a further 2 minutes and then rinse until the water runs clear. 9. Finish by using the in-pack conditioner to ensure a glossy pastel result! Want a different colour? See which other Ultra Brights shades you can use to recreate these pastel looks…and don’t forget to show us your own! #LIVEcolour on Instagram or post them to our FB page for the chance to feature on our website. Perfectly peachy with LIVE Pillar Box Red! Icy cool blue tones with LIVE Electric Blue! Classic bubblegum into vibrant pink with LIVE Shocking Pink! The video and images above refer to creating a pastel look with our semi-permanent LIVE Ultra Brights or Pastel range, you can find more details in the instruction leaflet enclosed in the pack. If you're using our permanent Lightener + Twist range to create an ombré look, these shades should be used according to the instruction leaflet enclosed in the box of your chosen shade. If you need any help achieving a pastel look, give our Schwarzkopf Advisory Advisory team a call on 0800 328 9214 and one of our expert colour advisors will be happy to help!